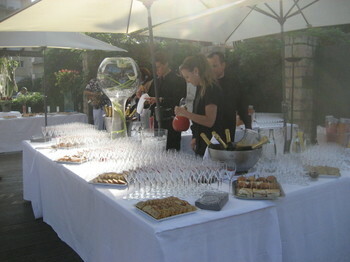 Pétanque & Pastis : They Got Married ! After a very busy and successful stateside séjour, we are back in Antibes just in time for the summer festivities, starting very close to home. 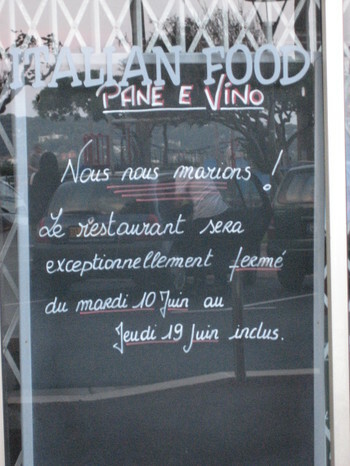 Our next-door neighbors, Julie & Rico, proprietors of the nearby Italian restaurant, Pane e Vino, got married ! 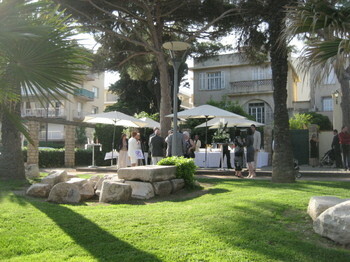 They had their Civil Wedding Ceremony on Thursday at the Mayor’s Office, followed by un Cocktail on the lovely terrace of Restaurant Le Bastion, just two steps from our apartment. The champagne flowed and the hors d’oeuvres kept coming while the music wafted through the warm evening breeze, as Julie & Rico made the rounds while handcuffed to one another. 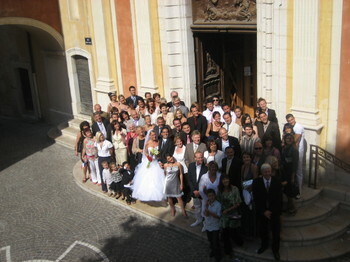 The Church Ceremony took place today at the Cathedral of Antibes in the Old Town. There must have been a lot of weddings today because there seemed to be a line to get into the church for their service, so they and their entourage had to wait their turn. They went in with Julie holding a bouquet of flowers with both a French flag and an Italian flag, while Rico was holding onto an Italian flag. Some other members of their entourage seemed to be holding onto Italian flags also. Dave and I were not invited to the church ceremony today, but we were encouraged to stop by to greet them in front of the Cathedral. So, we’re curious as to which of the two dates they consider to be their wedding anniversary? Is it the civil ceremony or the uncivil, I mean, religious ceremony?